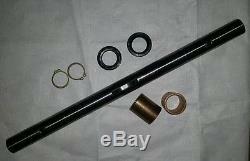 Shaft kit includes replacement shaft for original parts 1878 / GW 1878 and what you see in the picture 1. Replacement Shaft for GW 1878 2 Snap Rings. 2 End bushings / Bearings - 1086, GW 1086 2. Seals to replace 921- 04031. If they are not 1 in diameter then this is the wrong part. The item "Shaft kit GW-1878 Troy Bilt Horse Tiller Garden Way MTD seals bearings bushings" is in sale since Thursday, August 20, 2015. This item is in the category "Home & Garden\Yard, Garden & Outdoor Living\Outdoor Power Equipment\Tillers". The seller is "pae28" and is located in Port Trevorton, Pennsylvania. This item can be shipped to United States.